In Laos, there is no such thing as universal pension or social security benefits for elderly people. You work most of your life to save up for medical care and other necessities when you are no longer able to work. If you are fortunate enough to have children or grandchildren to take care of you when you need them, then life is a little easier. This grandmother caught my attention at the morning market in Luang Prabang when I was visiting in February of 2010. She was making Kanom Jok and selling them with an assistance of her grandchildren. I sat down with her and had a small talk and I told her how Kanom Jok was my favorite treat as a kid in Vientiane. My grandmother used to walk me to a pho stall by the intersections at Ban Nongbone to buy the kanom for me. She must have been touched by my story so she always gave me an extra piece or two when I bought the Kanom Jok from her and I shared half of them with an old man, who was roaming the market for food. When I came back from Laos, I thought of going to back Luang Prabang and visit many people that I made a contact with during my first trip to the town. This grandmother stood out in my mind because she was a hard working grandmother and gave me much inspirations. When I went back to Luang Prabang in October-November of last year, I went to visit her and found her working alone. She remembered who I was, just like all others that have met me. The grandmother told me her granddaughter is married now and moved away so she works alone. In the morning she sells Kanom Jok and when it’s meal time, one of her grandchildren would bring food to her. 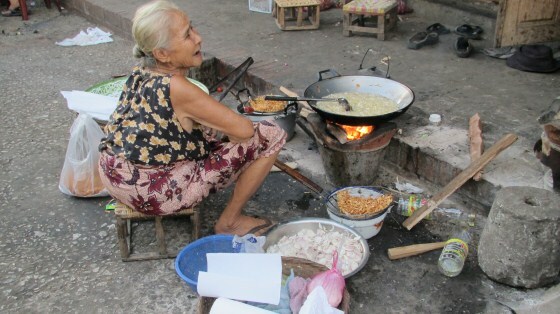 In the evening she fries shallot for daughter who sells Ban Guan at the morning market. When I told her I just bought some Ban Guan for dinner, the grandmother told me it was her niece (her younger sister’s daughter) that owns the food stall where I purchased my dinner. We talked for awhile and she told me that she doesn’t mind the hard work and that it is a good exercise (ork gam lung gai) for her and it’s also fun as well because she is surrounded by her family members that are also making a living at the market. your video quality is very good, very clear.